Jeff Starr is an ambitious man. He was already drawing, designing and writing before the web was available. When he was in college, he and some friends got into desktop publishing. After college, they wanted to be able to publish their work online, which made Jeff start as a web designer. 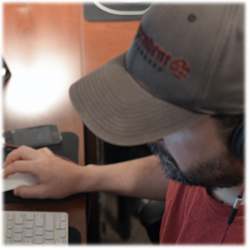 After a few years as a web designer, Jeff stumbled into WordPress which got him digging deep into web development. He started writing on his blog 'Perishable Press' about everything he encountered and co-authored the book ‘Digging Into WordPress’. Nowadays, Jeff published four books, owns several websites, created dozens WordPress plugins and themes and wrote hundreds of articles. 1.Most readers are familiar with you and your work thanks to PerishablePress and Digging Into WordPress. For those who don't know you well, can you tell us a bit about yourself, your background and what you do? I’ve always been creative, drawing, painting, and building things since I was a kid. Growing up before the Web was available, I did a lot of drawing, graphic design, desktop publishing, and writing. In college, some friends and I got into desktop publishing, which involves a lot of writing, design, and lots of editing. After college, we continued publishing stuff and wanted to share our work online. That’s when I first got into web design, mostly learning basic HTML and CSS and trying to cobble together a few simple web pages. It didn’t take long working online before I was hooked. In 2008, about the time I started developing WordPress themes and plugins, Chris Coyier and I wrote a book called Digging Into WordPress. That whole experience really took things to the next level and pretty much changed my life on the Web. The book’s success enabled me to quit my “day job” and focus entirely on working online. Making the transition to independent work was exciting and inspiring and scary all at the same time. Since then, I’ve been working as an independent designer, developer, author, editor, and publisher. It’s been about five years now since I took that big leap and quit my day job, and I continue learning as much as possible and working long hours doing work that I enjoy. I’ve written three other books, published hundreds of articles, started a premium plugin site, developed a dozen or so free plugins, and continued with more projects that you or anyone else cares to read about here. Over the years, I have spent much of my free time helping people for free with their security, WordPress, and general web design questions. I think that’s the best way to summarize what I enjoy most: helping people succeed on the Web. In 1999 or so, a group of friends and I decided to put our printed magazine, Dead Letter Art, online. Online documentation was pretty thin back then, but with the help of some IT gurus that we knew, we were able to get a server, FTP access, and even a database to experiment with. After several months of tinkering with HTML, CSS, and Flash (gasp! ), we launched out first rudimentary website for DLA. Of course by today’s standards the site was just pitiful, but it was the first step on the path to where I am today. 3.How and when did you get started as a designer/developer? Did you study something in particular or are you self-taught? After launching that first site, I was hooked. I began buying every book I could I find and practicing pretty much non-stop for the next several years. Eventually I started to get a flow going and launched Perishable Press, and things took off from there. So although I didn’t go to any formal school for coding or design, I’ve been studying and working independently on the Web for the past 15 years. I do however think that my five years in college studying Psychology, Biochemistry, and Mathematics has helped immensely in learning the intricacies and nuances of web development. 4.What came first, the designer or the developer? I would say it goes something like: artist, graphic designer, desktop publisher, author, web designer, and web developer, pretty much in that order, but with lot of overlap. I think going forward that I will be focusing primarily on plugin/theme development and books. That is enough to keep me busy for the next five years easily. On the computer as soon as I wake up. Answer emails and support requests. Then take a walk, go to the store, run errands, etc. Back at the computer mid-morning and knocking out any small tasks, saving the bigger projects for the afternoon stretch. Work until dinner, break for a few hours in the evening and spend time with the family, and then back at it for several hours working the late-night shift. Generally I try to unwind before bed with a cold beverage and some entertainment. 6.What activities and hobbies do you enjoy when you're not behind your computer? 7.Do you consider yourself more of an entrepreneur, or a designer/developer? Both. While working on the Web, I run the whole gamut of roles and responsibilities. With books, for example, I do the planning, writing, editing, layout, design, publishing, distribution, promotion, and everything in between. Likewise for web development, I plan, develop, test, test some more, and then promote and maintain things as much as possible. It’s a lot of work and responsibility, but the creative control and freedom really makes it all worthwhile. 8.What’s the most important thing you’ve learned since working for yourself and what advice would you give someone starting out on his/her own? Don’t be lazy. Think for yourself. Learn how to troubleshoot and test stuff. Don’t follow trends blindly. Listen to others. Never stop learning. Find balance in your life and don’t spend your entire life in front of the computer. Also, always keep in mind that life is short, so take some chances and enjoy the ride. 9.How do you stay on top of current design/development trends? Mostly RSS feeds of my favorite sites, as well as Twitter and some other social media. Plus a lot of kind folks send me news and tips via email, and of course you can’t help but notice all of the latest stuff when surfing around on Google, YouTube, tech sites and so forth. When something new sparks my interest, I’ll take some time to check it out. I’ve a growing list of bookmarks and ideas that I’ll probably never have time to fully explore. 10.What is the coolest thing you ever designed/coded? Either of my premium plugins, USP Pro or SES Pro. USP Pro is aimed primarily at WordPress developers, and can do some really cool things with front-end content submission. I’ve seen some amazing projects built with USP Pro. And SES Pro I am proud of just because of its sleekness and flexibility. Beyond coding stuff, I would say that Digging Into WordPress is the coolest project I’ve done. Really was a great experience working with Chris Coyier -- a truly amazing person. 11.What was the prime motivator for the creation of perishablepress.com? I started Perishable Press as a place to learn WordPress and write about web design and development. If you surf around the site, you can still see a bunch of old articles and posts that were entirely experimental. At one point, the site had over 20 themes that visitors could choose from, but maintenance got to be just too ridiculous so I removed them. I guess the focus of Perishable Press eventually shifted from experimentation to sharing in-depth articles on web development and security. As the response grew, I ramped up the tutorials and kept posting all sorts of stuff, anything and everything that is relevant to working online. Perishable Press was my door to professional web development and much more. 12.Which people/friends from the web-design/-development industry are important for you, who do you look up to and who contribute, in your opinion, in the most effective way to the community? I look up to pioneers like Jeffrey Zeldman, Eric Meyer, Jeremy Keith, Douglas Bowman, and Shaun Inman. Getting started online, I learned a great deal from the developers who were there before me, sharing their wisdom and making it possible for others to join the game. These days it’s more challenging to keep up with all the awesome folks and everything they do, but I am inspired by people like Chris Coyier and Vitaly Friedman. They contribute tons of material and help many people in the community. Additionally, I think the entire WordPress development team has made an enormous impact on the Web, so much appreciation there as well. 13.How would you advice people to start with coding and/or designing? Read as much as possible and learn by doing. I think reading and hands-on learning are a great combination. Whatever works though, some people can watch a video tutorial and “get it”, so find what works and roll with it. 14.Where do you see yourself in 5 years from now? No idea. Hopefully someplace with Internet access. 15.How did you come up with the idea of writing your first book? In 2008, things with WordPress were much different than they are today. There weren’t as many plugins or themes and in many ways customizing WordPress required either some understanding of code or decent tutorials and examples. By then, I had been working with WordPress for about three years and wanted to share my experience with others, and also felt inspired to write a book on something in the field of web design and development, not necessarily WordPress. Pursuing the book idea, I asked Chris Coyier if he wanted to collaborate on a book project. He liked the idea and we began throwing around ideas for a good topic. Soon we agreed on a book about WordPress and about eight months later Digging Into WordPress was born. 16.How would you describe the experience of writing (or co-writing) a book? 17.What were your expectations when you published your first book (and did those expectations come true)? No expectations, really. We were both overwhelmed and completely awestruck when things started to take off with the book. It was just an incredible experience. Probably one of the coolest things I’ve done so far. 18.What about your other books? The .htaccess book shows people in plain language and with practical, copy/paste examples how to optimize and secure their sites with .htaccess. The Tao of WordPress is a complete user’s guide for WordPress and setting up websites in general. It begins with required tools and getting a good server, and then covers the entirety of WordPress at the beginner-to-advanced beginner level. Its zen-like approach to mastering WordPress makes it the perfect companion for new users, students, administrators, and anyone else who wants to rock their own WordPress-powered site. The most recent book I’ve written is WordPress Themes In Depth, which is more of an advanced book that focuses entirely on building awesome themes. The book begins with the basics and then dives deep into every aspect of WordPress theme development. So in addition to everything that you would expect, like theme templates, frameworks, customizing, settings, and every other feature, it also covers essentials like theme security, optimization, performance, testing, and distribution. It’s an A-to-Z guide that’s overflowing with examples and techniques. 19.After writing the books you’ve published, what tip would you give to a starting writer? Do your research, know your audience, and be yourself. Write about something that you care about and want to share with others. I could write a book on this topic, but that pretty much sums it up. 20.What makes your book ‘Digging Into WordPress’ better than other books about WordPress? I think a big reason for the book’s success is that is was written with a real passion for the subject. It’s got a lot of heart and is very down-to-earth. Reading the book, you get a sense that the authors are right there with you, and that they really care about helping you learn WordPress. Beyond that, the book is great because it is packed with awesome content, examples, tips and tricks. Plus, Chris did an excellent job with the book’s design, which is optimized for maximum learnability. Five years later, Digging Into WordPress is used at over 130 colleges around the world, and helps thousands of people learn how to use WordPress. 21.How do you feel about the internet pirates that upload/share your books for free, and what do you do about it? Overall it’s just sad and a huge time waster. Eventually I think the war between pirates and producers will result in the lockdown of the Internet, or a huge part of it. As depressing as it is to think about, the Web ultimately will be a heavily regulated, excessively taxed entity. And I think stopping pirates and other bad guys will be a big factor in the rationale used to lock things down. You may scoff at the idea, but if you do your research you will find that it’s already happening, one tiny little step at a time. 22.Are there any plans ready for a new book? 23.What was your first encounter with WordPress? Before 2004/2005, I had been learning web development mostly from books and creative experimentation. Most of my projects were dynamic (e.g., MySQL and PHP), but I was building them all from scratch. In 2005, I started exploring other options and discovered a few decent blogging scripts, like b2 and WordPress. Compared to some of the other scripts I had tried, WordPress was far and beyond what I had thought possible, and it really saved a lot of time building new sites because I didn’t have to reinvent the wheel every time. There were lots of limitations, however, as to what WordPress could do back then, so a lot of my time was spent hacking and customizing things to suit my needs. Needless to say after a year or so exploring the possibilities, I was hooked and it all continued from there. 24.What did you like so much about WordPress that made you dive into it? Looking back, I liked that it couldn’t do everything with the click of a button. That would have prevented me from digging in and learning how things actually work behind the scenes. The need to customize WordPress drove my initial work as a web developer, and I enjoyed every minute of it. 25.Why do you think WordPress got so popular? Because it just makes everything so ridiculously easy. At first it wasn’t that way, but as updates continued to roll out, the software just kept getting better and better – better software meant better plugins and themes. Eventually WordPress hit a point of critical mass around version 3.0. At that time, it really covered a lot of bases in terms of functionality, which enabled people from all walks of life to get online with their own awesome websites. People love the ease of WordPress, plus all of the features, plugins and themes are a win-win for everyone. 26.What makes WordPress nowadays so fun for you that you still work with and write about it? I still use WordPress because it enables me to build virtually whatever I want rather quickly. Plus it’s free and open source. I’ve tried all sorts of other software, but nothing really “clicks” the way that WordPress does. So I write about it because I want to help others share in the same benefits and prosper online. 27.What do you think are the biggest advantages and disadvantages of WordPress? As mentioned, the advantages include the fact that WordPress is open source, and that there are endless plugins and themes for just about anything you can think of. Disadvantages include things like bloat, where stuff is added to the WP core that should be left to plugins (e.g., emoticons). Also, WordPress can chew up a lot of memory and other resources on the server, so it would be awesome to see more focus in the performance arena. But other than that I am quite content and have no complaints. “It’s all good,” as they say. 28.What do you think about the evolvement of WordPress from blogging system to a complete CMS (pro’s/con’s)? I think that it’s one of the reasons why WordPress hit critical mass several years ago. The software began appealing to a much wider audience, and designers and developers began using it to make their lives easier. So in general it’s a good thing, but the flipside is that it has to do so much more as a CMS than as straight-up blogging software. A massive amount of functionality is packed into WordPress to accommodate a broad range of application. So while it’s nice to be able to do things like set up a network of sites, not everyone really needs to do so. 29.If you could share one piece of advice with WordPress newbies, what would it be? Take time to understand the software. Learn how to do some basic troubleshooting. And of course it is absolutely essential to stay updated with the latest version of WordPress, themes, and plugins. 30.What are your favorite WordPress plugins and themes? Primarily my own, because I use them on my own sites and actively develop and maintain them (and provide support for them). There are so many great plugins and themes, however, so it is difficult to try picking favorites. Plus it all depends on the specific goals and requirements of the project at hand. For example, in some cases Broken Link Checker is great, but only if your site has many links to manage. Likewise for comment spam, Akismet is awesome, but only if your site is open to comments. FWIW, I try to create sites that require as few plugins as possible. IMO it’s better to utilize core WordPress functionality than it is to configure and maintain a bunch of plugins. As for themes, they are evolving so quickly these days that I dare not say – whichever themes I mention now will be discontinued, outdated, or out of style by this time next year. 31.How do you keep your WordPress sites safe from hackers, spam and other security issues? Loaded question, but in general just keep WordPress up to date and use only trusted plugins and themes. Also highly important is to host on a secure server, so I stay far away from shared hosting, just too many bad experiences. I also use .htaccess to provide security for certain things, as discussed in my book, .htaccess made easy. 32.How do you think WordPress will evolve within the next years? Overall I think that WordPress is a winning recipe, and hope that it continues to prosper for many years to come.